Are you a cat person? If so, Japan is the place to go on 22 February because this is when Cat Day is celebrated. Now in its 30th year, Cat Day has lit up Japanese social media with endless portraits of cats as well as cat-themed doughnuts, cat-shaped biscuits, cat manga（漫画）, cats staring out of windows and so on. It is Japan's hugest popularity on social media. Known as "Neko no Hi", it was chosen because the date's numerals, 2/22 (ni ni ni), are pronounced fairly closely to the sound a cat makes in Japan (nyan nyan nyan). Over the years the day has become a commercial success, with shops and businesses releasing（发行） cat-themed items. Disney in Japan declared the day to be "Marie Day," while newspaper Asahi Shimbun marked the occasion with a special report from one of Japan's cat cafes, where you can sit for an hour or two in the company of numerous spoiled cats. 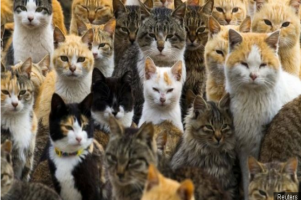 The event began in 1987 after cat-lovers across Japan was surveyed by an Executive Cat Day Committee and decided that February 22 should be Cat Day. Other countries also have days to celebrate cats, but few are marked with as much enthusiasm as Japan. There were some of Japan's celebrity cats. A cat called Tama made headlines after becoming honorary stationmaster of a train station in Wakayama county. Wearing a special cat-sized stationmaster's hat, she was a popular tourist attraction until her death in June 2015. Tama was correctly inducted（正式吸收……为成员） into a hall of fame for the station's train line in February 2016. Meanwhile, a cat called Maru became an Internet surprise with a series of YouTube videos. The videos have had huge viewing figures since 2008, with one early film gaining 21.7 million views. 1. What do we learn from the first paragraph? A How to play tricks on cats. B What happens on Cat Day. C When Cat Day is celebrated. D How to make foods of cats . 2. Why was 22 February decided to be Cat Day? A Because of the tradition. B Because of the preference. C Because of the adventure. D Because of the pronunciation. 3. How did Asahi Shimbun celebrate Cat Day? A They earned some money. B They dressed up like cats. C They used a special report. D They ate cat-shaped foods. 4. What was Tama considered to be? A A custom of sharing food. B A specific meaning of success. C A place where many tourists visit. D A role of togetherness of ceremonies.